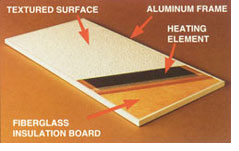 Radiant ceiling heat panels are well suited to drafty older homes. Radiant ceiling panels heat objects in the room rather than the air. Less energy is wasted heating air (which escapes through cracks). Radiant ceiling panels can be surface mounted with or without (wood) edge molding.